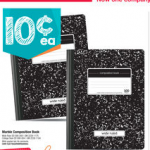 Office Depot and Office Max Penny Back to School Deals! 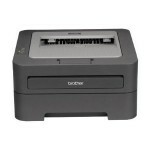 You are here: Home / online shopping / Office Depot and Office Max Penny Back to School Deals! I cannot BELIEVE that the Back to School deals have started already and I’m kind of in denial that I go back to work in a month, too! Even though I’m sad that I only have a month of summer left, I have to admit that I do love getting cheap school supplies! I always buy extras because my kids’ teachers usually ask for more mid-year and my kids love having extras at home, too! 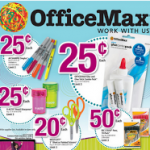 Here are the Office Depot and Office max Penny Back to School Deals this week: the two stores have now merged! My top pick this week is the Sharpies! I’m waiting for the deals on scissors, crayons, and colored pencils! We NEVER have enough of those! 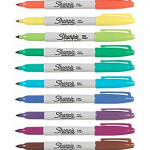 Sharpie Markers (12 ct) only $1.50 SHIPPED! 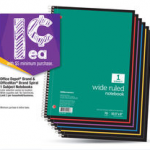 Office Depot and Office Max Back to School Deals! I might have to pick me up some of the penny erasers!